Dubai: Every step they took sent out a message that life is not about what you can’t do, but it is more about what you can. At the EmiratesNBD Unity Run, people with different abilities saw for themselves what a little of determination and support can help people achieve. 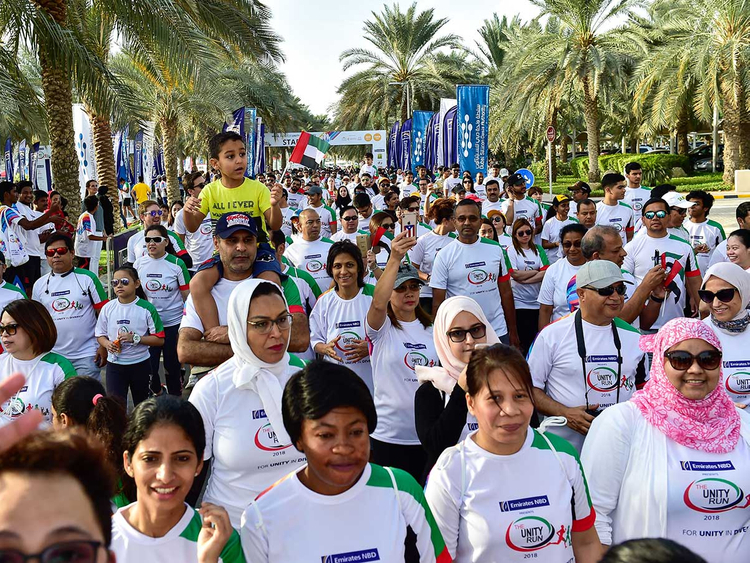 Running with families and friends, helping and egging each other on, people of all ages and abilities took part in the celebration of diversity and inclusiveness of the UAE at the third edition of the EmiratesNBD Unity Run. Held at Dubai Silicon Oasis, the annual event saw more than 3,000 people participating in a three-km fun run as well as a 10-km marathon, including a team of the UAE’s special Olympics team. “We are participating in this event because we want to support people of all abilities and their integration in the society,” said Ali Al Zuwailif, an Iraq expatriate who was running with his wife and their 18-year-old daughter with special needs. Al Zuwailif family was among dozens of others who came out early in the morning at Dubai Silicon Oasis sharing in the joy of life. “We run often and have been participating in the Unity Run since the first year. It is a great way to be part of the community and show that you care and support the diversity and inclusivity the human spirit,” said Alex Cargopolos from Greece, who was participating with his wife Joanna and two sons Ari and Theo. Supporting the cause also was Dr Nadera Al Borno, Professor of Special Education at the American University in Dubai. “I am participating because as a professor of special education I believe in the cause. It is so important to spread awareness. This is about giving equal chances to everyone. Everyone has equal rights to education and employment and it is important to raise awareness about this,” said Dr Al Borno, who ran the 3km run with her colleague Dr Jessica Maluch and her son Alexander. Organised by Fitt High Performance Centre in partnership with Community Development Authority (CDA), the event was held with the support of Special Olympics UAE. “We always ensure and look forward to participate in these important sports events which bring everyone together and unite us under the umbrella of sports. Special Olympics UAE provides opportunities for people of determination that are intellectually disabled to participate in the numerous sports and community events to ensure the sustainable growth of their athletic skills and abilities besides engaging them in an inclusive society,” said Talal Al Hashemi, National Director of Special Olympics UAE. The UAE Special Olympics UAE team will be competing in the Special Olympics World Summer Games to be held in Abu Dhabi and Dubai in March 2019. “For the first time the UAE will be competing in all 24 games at the Special Olympics and we will have the biggest team in the world with more than 300 member. We hope the whole of the UAE community will come out to support our team,” said Al Hashemi. Led by Emirates NBD’s flagship advocacy platform #TogetherLimitless, Emirates NBD Unity Run is part of the ongoing Dubai Fitness Challenge calendar. “This year we saw that more than a third of the participants are people of determination who are running with their families and celebrating the gift of life together. This event is about what abilities people actually and not about disabilities,” said Ruth Dickinson, event director and managing partner Fitt High Performance Centre.